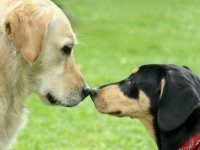 Many people seek dog training and socialization advice from professionals after there has been an issue with their dog. We professional dog trainers always suggest to start socializing and training your dog the moment you adopt them, especially for puppies. Puppies’ socialization windows close at the latest ages of 16 weeks to 18 weeks, which means you have until they’re about 3 months old to teach them the world is pretty cool and not so scary. However, many people also adopt older dogs, many of these dogs didn’t get the great start and fun educational experience some puppies we lucky enough to receive. So here are 6 quick tips to teaching your adult dog proper socialization training. Learn to Observe: The most important part of socialization training is to learn about your dog. Learn what makes them happy, learn what makes them sad, and learn what makes them scared and angry. The most important thing to observe is their body language. I suggest you look into Dr. Sophia Yin’s illustrations for dog body language to help you out. There are many helpful illustrations you will find to assist you in dog training for other things as well. Look at what makes your dog tuck their tail, what makes your dog bark, what makes your dog hesitate to move forward. Also, pay attention to what you do yourself when your dog reacts in such a way. Take a dog training and obedience course: Working with a professional dog trainer will help you in many areas. Dog trainers train you how to communicate with your dog, but we’re also here for support; we’re here to answer questions and problem solve with you. An obedience class will give you the communication tools for you and your dog to have a successful new interaction with a person or dog. Training classes are a great way to develop a positive socialization experience for your dog as well. While your dog is mostly focused on learning cues and eating treats, he’s doing so in a positive way by having no interaction with other dogs, but associating the other dogs’ presence with fun and food. Training classes are not play dates, they’re for learning; learning how to behave in the same room with a few other dogs under close supervision is extremely important. Know how to problem solve: While on a walk, you notice your dog becomes focused on another human or another dog, before Fido gets to bark, simply distract him with what you’ve learned in obedience class. A quick “watch me” or “touch” should do the trick to redirect his focus. Beware though, if Fido is nervous, don’t ask for too much. Work at your dog’s level. If Fido is too nervous and you ask for a sit or a down, you might be making Fido feel too vulnerable, so Fido won’t perform such tasks. Make it simple and easy so Fido will always succeed. A quick tip: Don’t let you emotions and stressors get the best of you! If you’re quick to react with a leash jerk, relax, use the skills you’ve been taught in your obedience classes. If Fido cannot succeed, you can always turn around and go back, if Fido doesn’t want to turn around, try to keep some space between you and the object of your dog’s attention; you can stop moving away until you see your dog relax as well. Once the object has passed, ask for a quick “watch me” and go crazy with rewards! Learn to ignore your dog: So your dog becomes terrified of something, whatever it may be, that’s fine; let him hide. Don’t go chasing after him to console his feelings, and don’t go trying to pull them out of hiding (that will put your dog into serious defensive mode and it could go back quickly). Do something that you know is appealing to your dog, cook up some stinky meatballs or a cheeseburger and leave it out for them to come out to enjoy. Wait for them, be patient, and reward them when they’ve gained the confidence to come out on their own. Eventually, if you wait your dog out, what they’re afraid of will end, they will get bored or hungry, or they’re too afraid to be alone still and they will come out. Just relax, nothing happened: Once Fido overcomes this fear, walks past the cat, or the scary man that was visiting just left; just relax. Act as if nothing happened. Wait Fido out, wait for him to come out on his own, continue to ignore his behavior, then go about your business as if nothing happened. Don’t console Fido’s feelings, all you’ll do is reassure his fears. Go sit down and hang out on the couch for your favorite TV show. Calm environments create calm dogs; if you make it a big deal, so will Fido. Make it all fun: Dogs are so much like children; if it’s not fun, they don’t want to do it. So make all of this socialization stuff like their favorite candy and rainbows. The more fun you show your dog that meeting a new person can be, they’re going to want to do it more and more. The more food you’ll arm your friendly and calm neighbor with for Fido, the more Fido is willing to say ‘Hi’ the nice way. Ask your friends to remain calm, use a monotone voice, and avoid fast movements until Fido is becoming more and more comfortable. If you’re socializing to other dogs, let Fido tell you what makes him uncomfortable. Walk past the dog park, instead of in it. Let Fido find his own ground and his own confidence in situations. Let Fido walk up and sniff the fence line, but let him back away if he needs space. When a dog comes up to Fido and Fido is calm, give Fido a super yummy treat he doesn’t always get, this tells Fido, “You did good kid!” If Fido reacts, give him space until he’s calm again. Always remember to be fun and interactive with your dog, never forget to reward them for their good behavior, and give them space for the undesirable behaviors.